Division II & III events for the 2006 Summer Music Games Tour have been added to the 2006 event calendar. 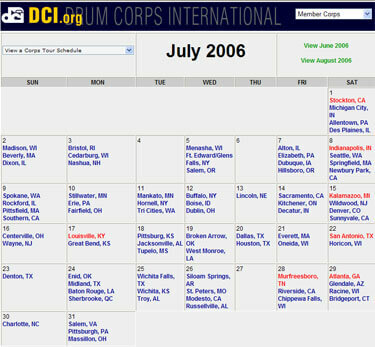 Remember that you can view any individual corps' tour schedule by selecting a corps from the pull-down menu in the upper left-hand corner of the calendar. See your favorite Division II & III corps this summer. Start planning your road trip today!